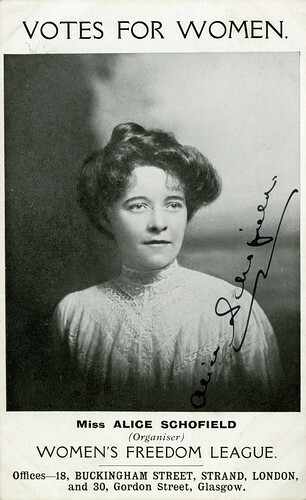 TWL.2000.160Postcard, printed, cardboard, monochrome photographic studio portrait of 'Miss ALICE SCHOFIELD', head and shoulders, front-profile, white border black text, printed inscription front: 'VOTES FOR WOMEN. Miss ALICE SCHOFIELD (Organiser) WOMEN'S FREEDOM LEAGUE. Offices - 18, BUCKINGHAM STREET, STRAND, LONDON, and 30, Gordon Street, Glasgow', signed 'Alice Schofield' in black ink in front bottom right corner.